Getting the right treatment requires the right kind of tools. At Apollo Clinic, India’s premier multi-speciality clinic, with centres across the country, our treatment rooms offer patients the best-in-class medical facility. Why Are Treatment Rooms Important? Getting the best treatment in a clinic requires a space that encompasses the right tools, coupled with the best specialists and medical experts, who ensure you prompt and world-class treatment. At Apollo Clinic, our treatment rooms, which are a part of the clinic’s patient care unit, offers a number of treatments or procedures that require specialised equipment. Our treatment in the clinic ranges from procedures like removing sutures, draining a hematoma, packing a wound to performing an examination. 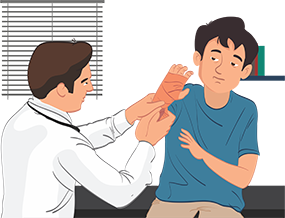 Getting Dressings or Plasters: Typically applied to wounds or broken bones, this form of therapy is used to protect the injury received, giving the body adequate time to heal from the same. Abscess/Boil Drainage: Typically carried out, as a treatment protocol, for certain skin disorders that result in pus-filled boils or abscess that need to be lanced. Stitches: Typically carried, as a treatment in our clinic, on wounds that need to be knitted back together. Nebulization: A treatment protocol that is implemented using a nebuliser, a drug delivery device that administers medication in the form of mist, which is inhaled into the lungs. Ear Cleaning: Usually carried out for patients who are suffering from ear blockage, ear wax or liquid build-up. Saline & Drip: Administered as a supporting treatment for patients who do not have enough fluids in their system to function properly. Copper T Insertion: Treatment protocol that is carried out as a birth control procedure. Injection Services: It includes medication that is directly injected into the body of a patient who requires medication.